To read Richard Davis’ complete foreward, click here. The year 2008 will be remembered forever in U.S. financial history as a transformational shift in terms of how the American political establishment views the financial services industry in this country. Its long-term implications are likely to have a negative impact on consumers, investors, economic growth, and jobs in the new regulatory reality unless that relationship is realigned with greater balance in mind for our economy. In Managing to the New Regulatory Reality, Gregory Wilson shows financial firms how to step up the way they manage their unique regulatory risks and new supervisory environment so that they can continue to support their ongoing competitive strategies and business models for serving customers and rewarding investors—and sustain profitability through all of the new red tape. 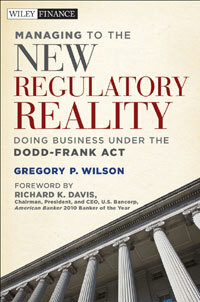 Wilson details the actions of the U.S. Congress to pass the Dodd-Frank Wall Street Reform and Consumer Protection Act of 2010, showing how the legislative process was just as important as the legislative substance. He also explains the importance of the new international regulatory actions of the Group of Twenty to global financial firms. He then offers ten universal lessons to help executives, directors, and others be bettered prepared for the future as the new regulatory reality unfolds over the decade. These manageable lessons include advice on such issues as executive compensation and consumer protection in the new political reality, the value of good governance, the importance of working with regulators to build trust-based relationships, stepping up their public policy advocacy to ensure better regulatory outcomes, and other critical issues. To be commercially successful in the new regulatory reality of the foreseeable future, management and boards will need to re-learn and fully understand the universally applicable lessons coming out of this crisis before the next crisis hits. This book will help financial companies of all kinds – operating in the United States and around the world – take steps now to prepare for the next significant market disruption—even if we can’t perfectly predict how or when or in what form it will strike. With Managing to the New Regulatory Reality as their guide, financial institutions can make the new policies and regulations work for them—not against them.